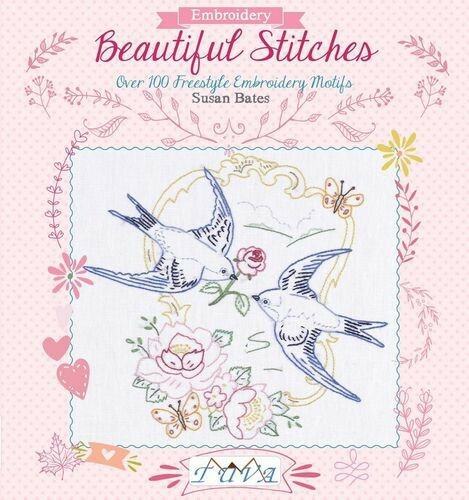 The publication, Beautiful Stitches, contains over 100 freestyle embroidery motifs and focuses on a variety of subjects, such as birds, flowers and the natural world. Susan Bates also includes trendy motifs that feature lettering, fashion accessories and travel. For those who enjoy relaxation, there are motif themes depicting tea and coffee breaks, and summer gardens. The book uses simple stitches, all clearly explained in the Tools, and Techniques sections. The diagrams are in full color and each project is beautifully photographed. The designs will appeal to both beginners and the more experienced stitchers, as there are small scale designs and also larger, more detailed designs. 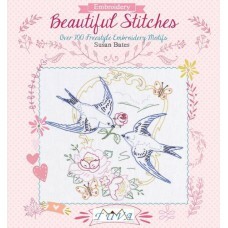 The stitched designs can be used to make into cushion covers, framed pictures, tablecloths and greetings cards. You could also use them to decorate purses and tote bags, or any other objects that you choose to decorate with your stitching.